This attractive and substantial antique partners desk was made in the mid 18th century style associated with Thomas Chippendale. The desk has a lovely sinuous shape to all sides and has the most attractive figured mahogany panels which are matched throughout the desk. It has recently been professionally cleaned and wax polished and has a well developed patina with a silky finish. The top is fitted with the original red leather with gilt and blind tooling. 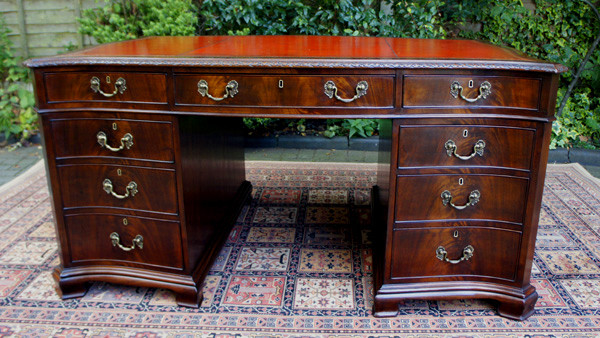 This attractive and substantial antique partners desk was made in the mid 18th century style associated with Thomas Chippendale. The desk has a lovely sinuous shape to all sides and has the most attractive figured mahogany panels which are matched throughout the desk. It has recently been professionally cleaned and wax polished and has a well developed patina with a silky finish. The top is fitted with the original red leather with gilt and blind tooling. This is surrounded by a cross band of mahogany, a floral carved edge and canted corners. the original ornate brass handles, brass escutcheons and brass locks. The pedestals each have three drawers and a cupboard with shelf to the reverse. The cupboard doors have faux drawer fronts to mirror the front and the pedestals stand on ogee bracket feet. As with most pedestal desks this comes in three separate sections; top and two pedestals, for ease of installation and transportation. 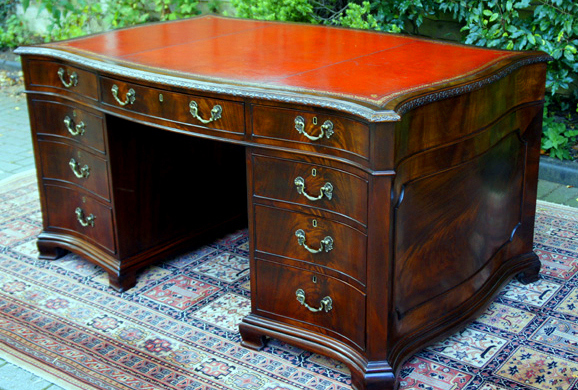 This is a good quality, well proportioned antique partners desk with beautiful serpentine lines. It has an imposing presence and very pleasing proportions associated with 18th century furniture. It would look stunning as a centre piece to any office or study.